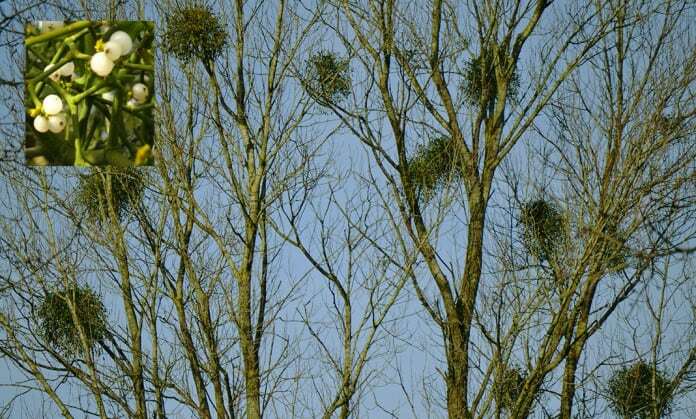 Clumps of Mistletoe growing on trees. The inset (upper left) shows a closeup of the plant with its white berries. Almost everyone associates the beautiful mistletoe plant with Christmas. Alongside holly, it is synonymous with the festive season and is commonly associated with stealing a kiss under a doorframe! But as with so many traditional symbols, its origins actually pre-date the Christian festival of Christmas and has roots in Irelands Celtic culture. The use of mistletoe can be traced back to far more ancient cultures in which it was revered as a fertility and health symbol. The Druids even believed that it would ward off evil. For the Irish Celts, the green-leafed and white-berried plant was a key cultural and fertility symbol and it was particularly revered for its healing powers. Because mistletoe grows on tree branches without being connected to the earth, Celtic Druids believed that the plant was an earthly manifestation of Taranus, the sun or thunder god. Trees that hosted the plant on their branches were believed to have been blessed and were held as sacred because the Druids worshipped the sun as a central focus of their spiritual practice. The belief was that the plant would absorb the host tree’s essence, which is actually a scientifically accurate viewpoint, as this plant essentially feeds off the tree. For these ancient peoples, finding the shrub growing on an oak, their most revered and holy tree, was of particular significance. In this situation, it was harvested in accordance with complex and lengthy ceremonies. Its leaves and berries were used to provide symbolic protection from evil, and to strengthen the body against poison and ill humours. Traditionally, the harvesting took place according to a tightly defined ritual practice. It followed the first new moon that appeared after autumn had fallen and six further days had elapsed. From a purely practical perspective, the trees were largely devoid of leaves by this point, making it rather easier to find the plant. This timing may well explain how the shrub became incorporated into Western culture and Christmas. As the Christian church became established, it was keen to retain symbols that people knew and with which they felt an affinity, albeit re-framed within the new Christian narrative. The reverence with which the Celts treated this green and iconic white-berried plant is hard to imagine in today’s day and age. During the harvesting process, it was treated with incredible care and was never allowed to touch the ground. It was considered to be so magical that valuable livestock were sacrificed to the sun god, to thank him for the gift. As the ages passed, the allure of mistletoe by no means diminished. From the druids to medieval times, it was called allheal in recognition of its medicinal properties. Its berries and leaves were used to treat an array of diseases including cancers and to promote fertility. As part of Druid rituals and other ancient folklore, it was also hung in stables and homes to protect against evil and mischievous spirits. Today, mistletoe is associated with goodwill, love, happiness and friendship and love is believed to reside in the homes that it adorns. In hanging a fresh sprig indoors every year, love is invited into the home, which explains why we have the modern practice of kissing underneath it.